I love poinsettias. I think I mentioned this before. Years ago, my mum would buy one every Christmas. I'm not sure what happened to them after the fact - she used to love plants so she must have looked after them - but somehow we never ended up with more than one and they vanished when they weren't festive anymore. I never really thought about it but I suppose I must have just assumed they were part of the Christmas decorations and simply couldn't exist if tinsel wasn't within a five metre radius. But because of that, I've become quite fond of poinsettias - then again, I suppose I'm fond of anything that reminds me of my mum's able days. Dad still buys her a poinsettia every year. It was dead simple to make, and while I did intend to paint it red, I've had enough of paint lately so I decided to leave it white instead and just paint some silver detail onto it, and I think it actually turned out better this way. 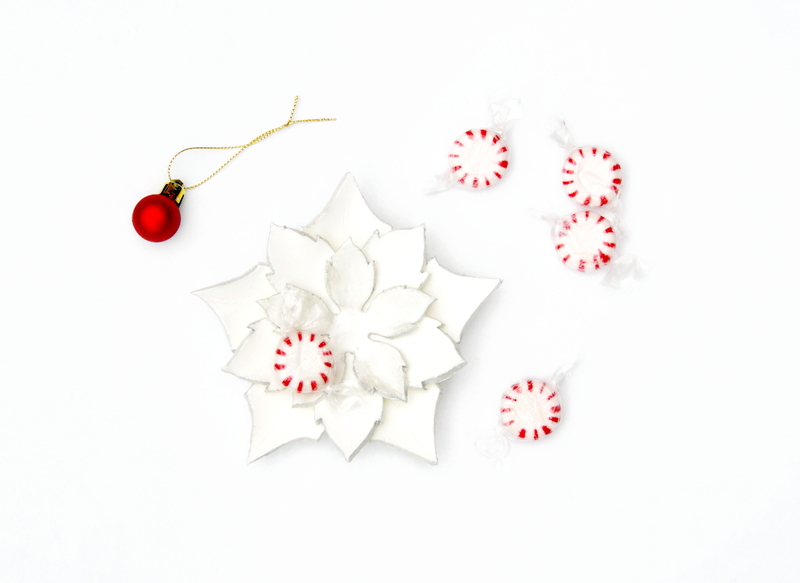 I used printable poinsettia templates from Carta, Forbici, Gatto's paper poinsettia tutorial for the shape, and it was a simple matter of just rolling out the clay, cutting around the templates (I used a sewing needle - my clay tools are so very advanced), and then stacking them up. I used rolled tissue to give shape to the petals and keep them elevated, and only pressed the clay down in the centre. I left it for two nights to harden - the clay was Fimo Air Light, which I wouldn't buy again because it took a long while to harden and even then felt a little too light and flimsy once it was finished, which is why when I did paint it on that third day I left the tissue beneath it to give it extra support. The day after that it seemed to have hardened further and I felt brave enough to remove the tissue. I have since reinforced the bottom with jewellery wire - make do with what you have - running along the length of each petal. I painted the edges of the flower silver and gave the smallest, top flower a silver wash. It was quick (if you don't count the drying time), easy peasy and, I think, quite pretty. I'm glad I didn't bother painting it red, I think it would have ruined it, and my red paint isn't matte so it probably would have taken a few extra coats and ended up with lots of visible brush strokes. 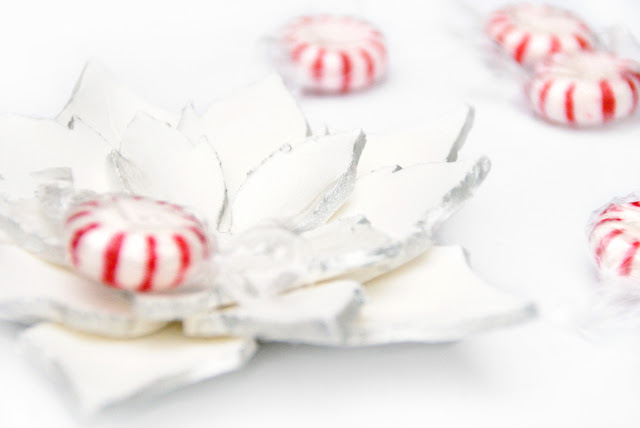 Plus, with peppermint candies, it looks simply spiffy.